ᐁᐅᑯᓐ ᒉᐧᑳᓐ ᑳ ᓂᑕᐧᐁᔨᐦᑕᒫᓐ᙮ eukun chekwaan kaa nituweyihtamaan. That’s the thing I wanted. ᐁᐅᑯᓐ eukun in the sentence above is called a focus pronoun. It is used to indicate who or what is most important at a certain moment. ᐁᐅᑯᓐ ᑳ ᓂᑕᐧᐁᔨᒪᒃ᙮ eukun kaa nitaweyimak. That’s the one I wanted. ᐁᐅᑯᓐ ᐊᓐ ᑳ ᓂᑕᐧᐁᔨᒪᒃ᙮ eukun an kaa nitaweyimak. That’s the one I wanted. 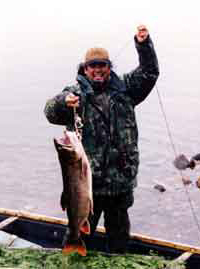 ᐁᐅᑯᓐ ᐊᓐ᙮ eukun an. That ‘s the one! ᐁᐅᑯᓐ ᐊᐧᐁᓐ᙮ eukun awen. That ‘s the one! ᐁᐅᒄ ᐊᓂᔫ᙮ eukw aniyuu. That’s the one. ᐁᐅᒄ ᐊᓐ᙮ eukw an. That’s the one. ᐁᐅᒄ ᐊᓐ ᑳ ᓂᑕᐧᐁᔨᒪᒃ᙮ eukw an kaa nitaweyimak. That’s the one I wanted.